Sustainability is a hotly debated topic, with just about as many “definitions” as people you could ask. The term “sustainability” is searched 49,500 times per month on average in the U.S., demonstrating its interest and consequence to our present and future. At HowGood, we have unique insight into sustainability factors based on our work with farmers, food scientists, expert sources, and leaders in the food system, guiding recommendations that can carry us to a more sustainable world. Our mission is to guide consumers to make informed decisions when buying products in a food system that critically lacks transparency. Here’s a glimpse into our approach through one product you may not have heard of, but that has earned a spot in our own office freezer. Bageladies, a small but honest company inspired by grandma’s recipes, stands out in their uncompromising mission to provide healthy, sustainable, and delicious products. The HowGood tenets of well-sourced ingredients, minimal processing, environmental responsibility, ethical labor, and social consciousness are actively embodied in their mouth-watering frozen bagels. A product’s ingredient list can tell you a lot about its environmental impact. At HowGood, we not only look at how ingredients are grown and sourced, but also factors further up the supply chain. How ingredients are processed -- which is part of their overall environmental impact -- has just as much importance in our minds than the farming techniques used to grow them. We reward companies like Bageladies that use simple, wholesome, high-quality ingredients and lower-impact (i.e. lower energy-intensive) production methods. Many pre-packaged bagels contain dough conditioners, fillers like xanthan gum and maltodextrin, and/or emulsifiers like mono- and diglycerides and soy lecithin. While these additives may not be dangerous to consume, they are generally created using intensive processing methods and used to compensate for poor production techniques and low-quality ingredients. A common ingredient in many packaged foods, soy lecithin is nearly always derived from GMO soybeans grown as resource-intensive monocultures. Her plain bagel, called the Big City Original Bake’mm bagel, has only 6 ingredients: Certified organic unbleached wheat flour, filtered spring water, certified organic cane sugar, bakers yeast, pacific sea salt, and corn meal. Compare this to the ingredient list on your average frozen store-bought bagel, and you’ll see why they passed our rigorous evaluation process. To advance our goal of creating a more sustainable food system, HowGood identifies eco-conscious producers who are raising the bar with their commitment to sustainability. We find products that meet or exceed USDA Organic standards -- regardless of whether they can afford to apply for an official seal. 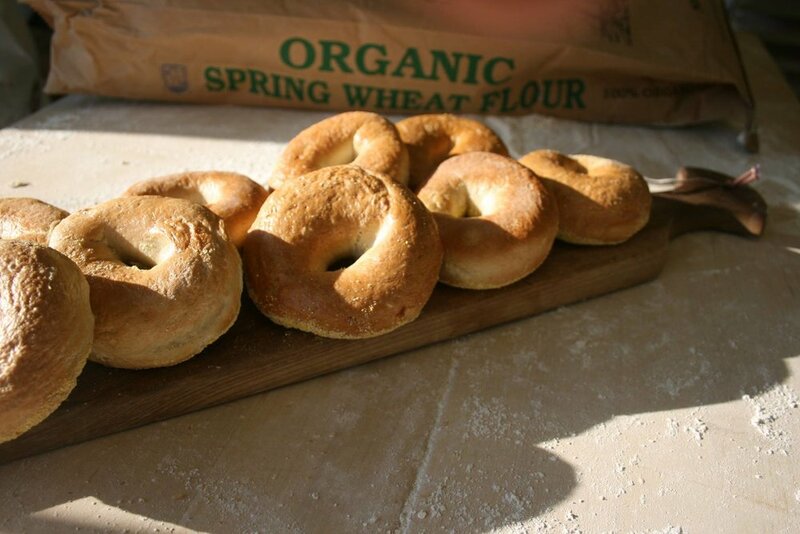 While Bake’mm bagels are not currently certified as USDA organic, they are made with organic, non-GMO ingredients and produced in accordance with USDA organic standards. Bageladies also sources ingredients from local Virginia farms whenever possible to reduce emissions and environmental impact. Janet’s commitment to keeping it natural extends beyond her Bake’mm bagels, too. Their production facility and equipment are steam-cleaned to avoid the use of harsh chemicals that can harm the environment. It’s not just the environmental impact that matters to us: a truly sustainable product is made by people who are treated well throughout the supply chain. HowGood holds companies accountable for the labor conditions they endorse in every phase of their supply systems, as well as their management structure, employment practices, and community relations. We reward brands that ensure better working conditions, higher pay, and transparency throughout all levels of the company. We even identify those that have a positive impact on their local communities. Janet believes happy, healthy workers make the best bagels. Bageladies also works closely with a Virginia non-profit called Green Dogs Unleashed, which rescues, rehabilitates, and trains unwanted dogs to become service animals for people with special needs. Being a socially- and eco-conscious small business in today’s economy isn’t always easy. From the rising cost of ingredients to forfeiting her organic certification when the economy crashed, Janet has faced many challenges since starting Bageladies. Despite these hurdles, one thing is clear: she’s not willing to cut corners or compromise the integrity of her brand. The reward for sticking to her mission? With consumers demonstrating in growing numbers that these are the issues they care most about, that loyalty is only on track to grow. Janet’s advice to other aspiring food entrepreneurs who are trying to maintain high standards is to never compromise if you can help it.